sarah m style: around the house: hank's loft closet. 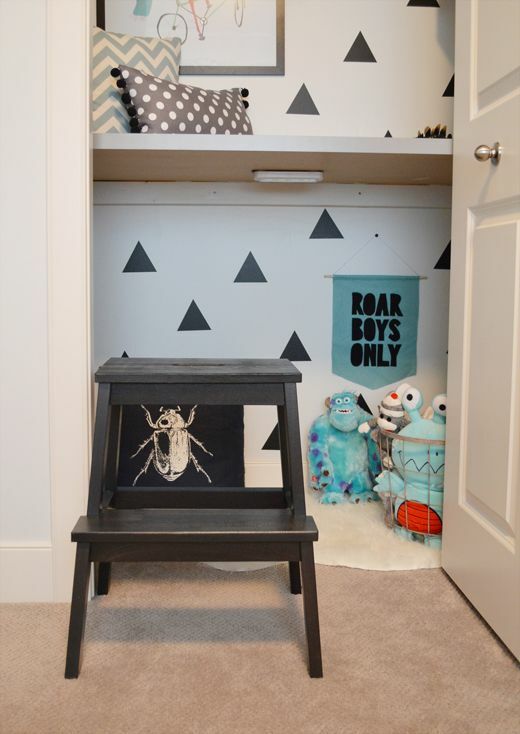 around the house: hank's loft closet. 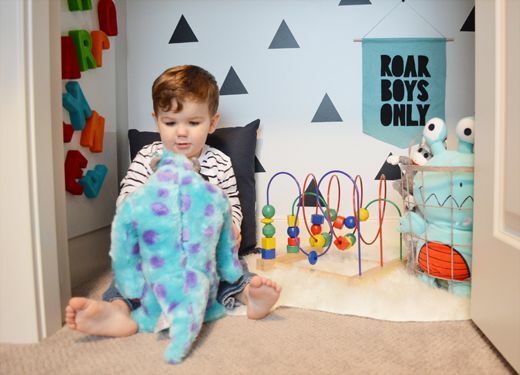 we had tossed around the idea of making hank's closet into a little play space. i was simply going to make the bottom of his closet under the middle shelf a little nook with pillows, a magnet board and a few play things but once my husband saw this idea on pinterest, he wanted to go for it. i was a wee bit leery about giving up the storage space above but hank has a 6 drawer dresser in his room and it already had two vacant drawers, so we managed to easily fit everything inside... so, we went for it! the middle metal wire shelf was removed and i painted the closet the same paint color as the rest of his room. we left the top shelf as is just incase the closet needed to be converted back to storage in the future. we found a grey desktop from ikea that was the perfect width, and with the help of a friend's table saw, we trimmed a slice off the back for a snug fit. the desktop itself holds up to 110 lbs when supported so we have no qualms about durability. my husband built a sturdy bracket around the closet walls to support the desktop using standard 2 x 3s screwed into the studs. 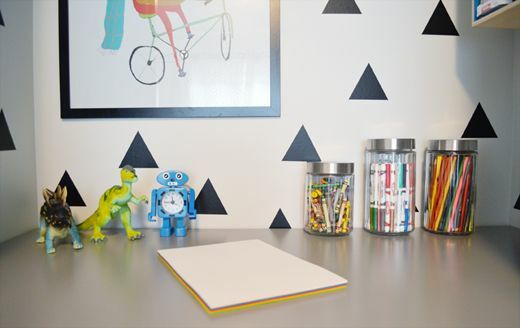 i am in LOVE with the black triangles from UrbanWalls. i randomly placed the triangles throughout the space, allowing my 3 year old to dictate where they should go. on the top floor, this awesome print hangs in an ikea poster frame. 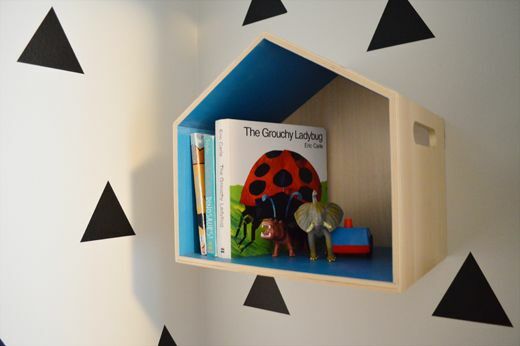 i finally got my hands on one of these little wooden house shelves from target giving storage to little board books, animals and lego men. 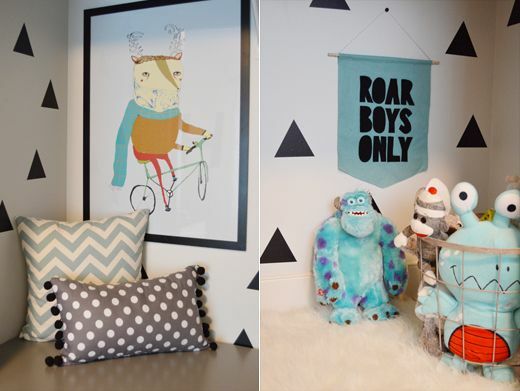 the cushions are handsewn and repurposed from his nursery. the bottom floor lights up with two adhesive battery push lights. we call them hank's dancing lights, because if they're on... he's dancing. no music required. what a kid. the space is cozied up with the faux sheepskin rug and a basket of his favourite stuffies. he also has a magnet board to play with his alphabets. i crafted a cute felt sign using wool felt, a dowel and twine. it doesn't seem to work though... hazel is always in there! for easy climbing, we're using the BEKVÄM step stool. i had bought this for my kitchen for my little helpers but if it's in there, hank is always standing on the counter searching in my cabinets! since we didn't install a permanent ladder, we left the closet doors as is but may build one and remove the doors in the future. 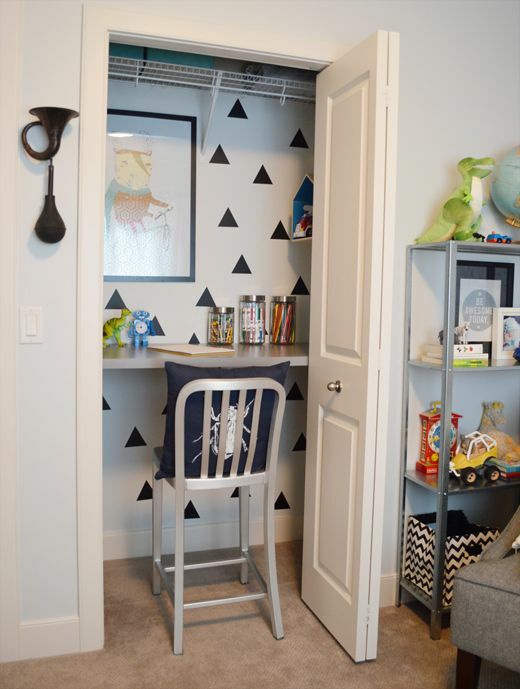 we installed the second floor at 36 inches a great height giving him enough space to play on the bottom and top, and best of all, it can easily transform into a closet desk space when he's older! This is wonderful! 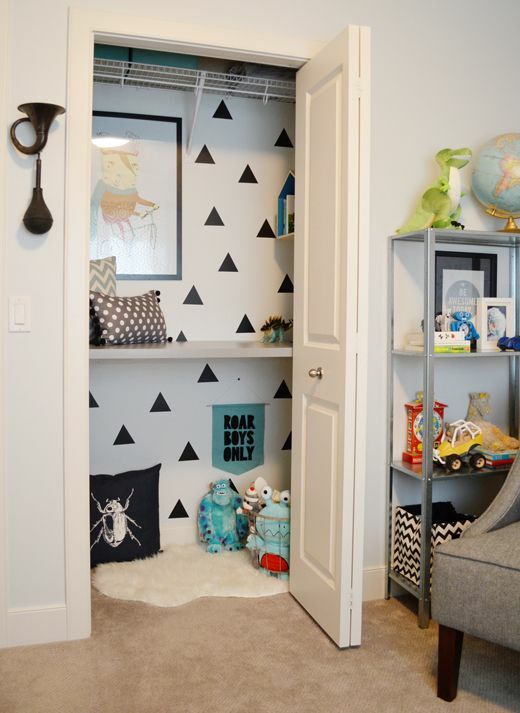 My son will be two in a couple weeks also and I've been wanting to do something like this with his closet as well! Question though, where do you put his shoes? My son's are currently in an unused drawer in his dresser but if we get rid of the clothes in his closet there won't be room for them in the dresser any longer :) Thanks and great job!!! Thanks for your comment Stacie! We are lucky to have a fairly large mudroom and entrance closet on our main floor so the kids' shoes and socks are in sorted bins. during the cold months, he's usually in boots and much of his summer accessories are packed away. the shoes he does wear though, are tucked in bins in our mudroom. i'm finding having the socks on the main floor all together in our mudroom so handy. i always had to send my oldest back upstairs to nab socks for school!